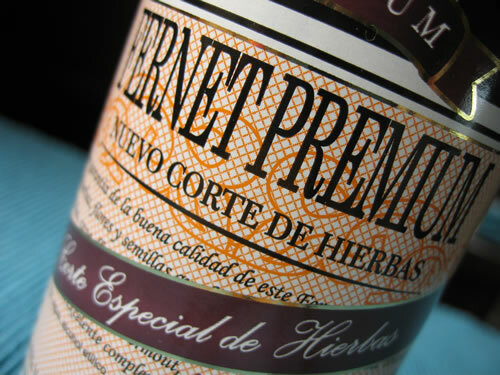 I only crack open the Fernet Premium on special occasions. What’s up with all these booze posts lately? Am I on a bender? Wine in a box up next? Two prominent aromas battling each other here. One has a quite pleasant sweetness of brown sugar and molasses. Dark Caribbean rum comes to mind. The other, metallic, like an old toolbox. Herbal notes are hiding right around the corner. Initial taste hits you with an explosion of mint followed by another huge burst of medicinal bitterness. Totally different than the aroma yet with a sweetness that is again, comparable to dark rums. For having an alcohol level of 45%, this herbal concoction is remarkably smooth on the tongue and throat. I say smooth because there was no fire going on, but lemme tell ya that my upper body tweaked and twisted a bit because of the taste. Mixed with Coca-cola, on the other hand, both aromas that I noted hit before, hit me in full force on the flavor front. Sickly sweet and not something that I could see being enjoyed like Fernet Branca y Coca–well unless you want to get plastered. Fernet Branca cuts through the sweetness of Coca-cola like a samurai sword while punching you in the groin at the same time. This one needs to be sipped after a hearty meal. I don’t know how often “bitters” are used as reduction sauces, but I could definitely see this beverage standing up to the task. Lamb season is right around the corner so look forward to some experimentation.